Isn’t that yellow wallpapered staircase gorgeous? 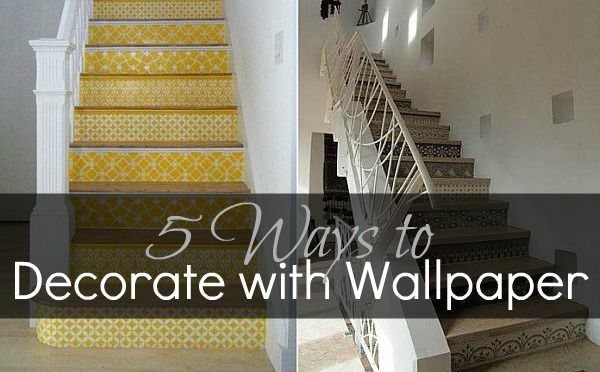 Infarrantly Creative featured it recently on 5 Ways to Decorate with Wallpaper. I couldn’t stop thinking about it and goggled “yellow wallpaper” a million different ways. I couldn’t find anything, so I went to the store and bought a beautiful scrapbook paper pad where the papers all coordinate. My stairs needed to be painted anyway (and cleaned, ahem) so I used some navy blue to freshen it up. I modpodged the papers onto the back of the stair treds and Voila! I have cool stairs! My basement is an unfinished disaster zone, but I smile every time I see them. Oh my gosh Amy it looks fabulous! It makes me smile too. Kudos my friend! OK, you clearly have too much time on your hands so could you please come up to Wisconsin and do some stuff at my house!